Meter White Thermal Binding Covers are the most popular cover used in Thermal Binding. 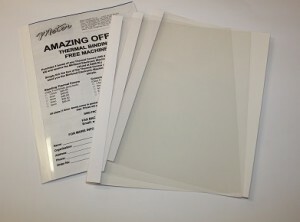 These Thermal Binding Covers have a Clear Front and a White Semi Gloss Board Back.. Available in 9 different sizes to suit various document sizes ranging from 1 page to 250 pages. Meter White Thermal Binding Covers will work well in all brands of Thermal Binding Machines – that don’t require a metallic strip. Call us for friendly advice on your Thermal Binding Cover needs.